Today is all about chocolate. 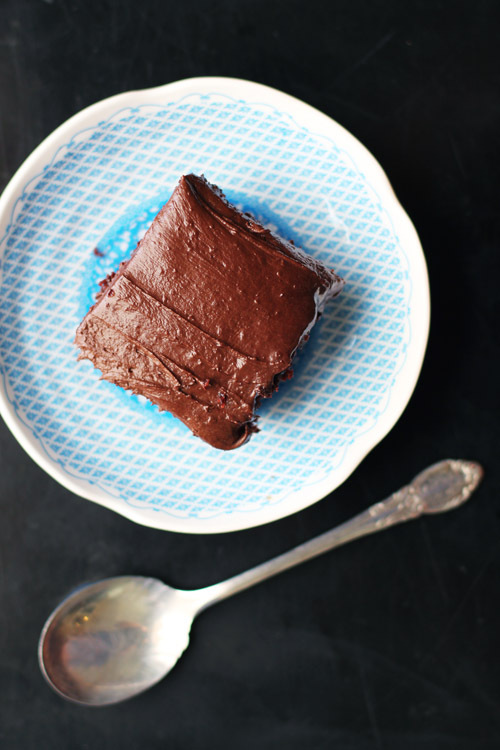 And, if you’re looking for something to put that perfect chocolate frosting on, let me introduce you to the one pan chocolate cake. 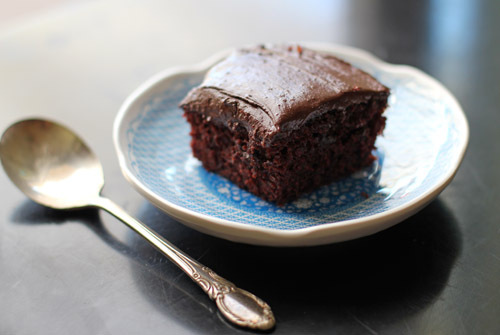 This recipe comes from a 2009 issue of Everyday Food and was originally called “dump cake,” since you just dump everything in the pan and then bake. The cake turned out beautifully. There’s only one drawback to the cake recipe: since you mix the ingredients directly in the pan, you can’t butter and flour the pan ahead of time. This means you’ll be serving the cake directly from the pan. Plus, you kind of have to scrape the servings out with a spatula to keep them in one piece, and the first slice of cake will be a bit tricky to get out of the pan. Because of this, the one pan cake may not be the best choice for serving guests or for special occasions. Or maybe it is. You decide. All I know is that this cake recipe is easy and delicious, and maybe that’s all that matters in the end. Melt the butter in a large bowl in the microwave, in 20 second increments until butter is just melted. Add 1 cup of powdered sugar to the bowl. Using a hand mixer, start on low and beat in the powdered sugar, increasing the speed to medium and mixing well. Add half of the milk, following the same blending technique. Add 1 more cup of the powdered sugar, mixing as described, then the rest of the milk, mixing once again starting on low and increasing to medium speed. Add ½ cup of powdered sugar (this brings you to 2½ cups) and blend well, starting on low then moving up to medium speed. If you want the frosting to be a little thicker, add up to ¼ cup more of powdered sugar. Makes enough frosting for a 9" x 13" cake. In an 8-inch square casserole dish or baking pan (I like to use a pyrex casserole so I can see if the batter is full mixed), whisk together the flour, sugar, cocoa powder, baking soda and salt. 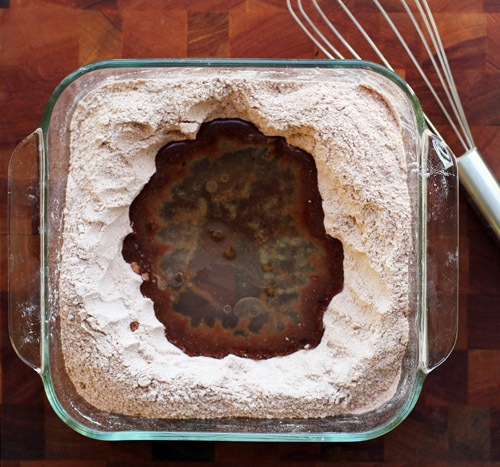 Make a well in the middle, then add the vegetable oil, vanilla, vinegar and water in the center. Whisk those ingredients together, then start to incorporate the dry ingredients, whisking until well combined. Bake for 35-40 minutes, until a fork or toothpick comes out clean. Let cool completely before frosting. 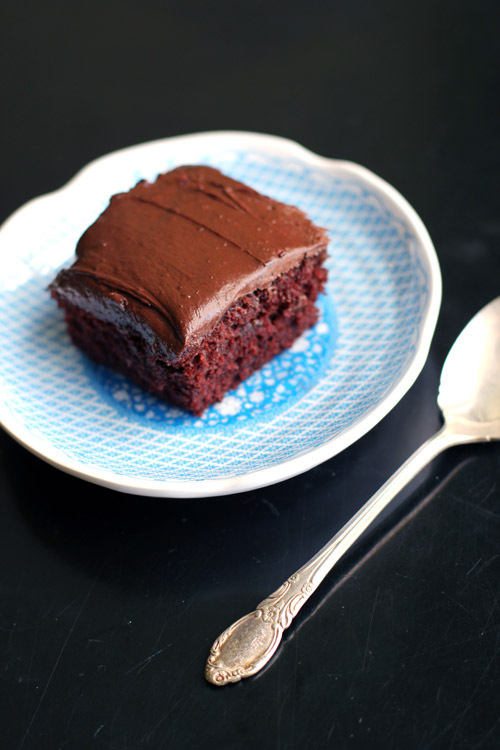 If you use the chocolate frosting recipe above, you will have some frosting left over. I just love recipes like this. It reminds me of a cake my mom makes, except there’s never a frosting attached to it. I want to try this! also, I’m sure your mom’s recipe is so good – all of hers are! Thank you for the wonderful recipe! I made this cake today and it was very good! I miixed the ingredients in a bowl because I was taking it to my mom’s for dessert and wanted to make sure it came out of the pan easily. I will definitely make this again. so glad the cake worked so well for you, and mixing it in a bowl is a great option! thank you for commenting! so glad you liked the frosting – thank you for letting us know how it went! One bowl baking recipes to keep it simple. And delicious.